A stunning contemporary renovation has transformed this charming colonial into a modern and stylish family home, which offers relaxed and practical living in a sought after location. Occupying a 647m2 block, the 5-bedroom property has living spread over two levels, a large swimming pool, flat backyard and the perfect north-east aspect set in one of the inner-west's premier streets. A lovely front and side verandah provides a traditional facade and inside many character features have been preserved. There are polished timber floors, intricate vents over the doors and high ceilings, complemented by a sophisticated and timeless colour palette. There are three bedrooms on the upper level. The large master has a walk-through robe and ensuite with bathtub. The other two rooms both have built-in storage and French doors accessing the verandah. These rooms share the main bathroom, which includes a shower and bathtub. A wide hallway runs through to the back of the home, which has been architect-designed and opened to reveal light, airy and liveable spaces. The sleek kitchen has a fabulous island bench, topped with a huge expanse of Carrara marble. There is an extra wide Smeg oven with gas hotplates and seamlessly integrated cabinetry. Retractable glass sliding doors open to a large back deck, offering a wonderful spot for alfresco entertaining, while an internal dining area with banquet seating is ideal for cooler nights. Blackbutt stairs lead down to an elegant, mid-level lounge area, where the soaring ceiling and full height windows create a striking effect. The lower level of the home has two additional bedrooms; both are a great size, with storage and integrated shelving. They share a bathroom with a large shower and the laundry is also on this level. You will also find a dedicated homework or study zone and a rumpus area, creating a practical and useful retreat for children. Sliding doors open to the chic entertaining patio, with travertine tiles and an integrated BBQ, sink and wine fridge. Kids will love playing on the large, flat backyard and splashing in the heated swimming pool. 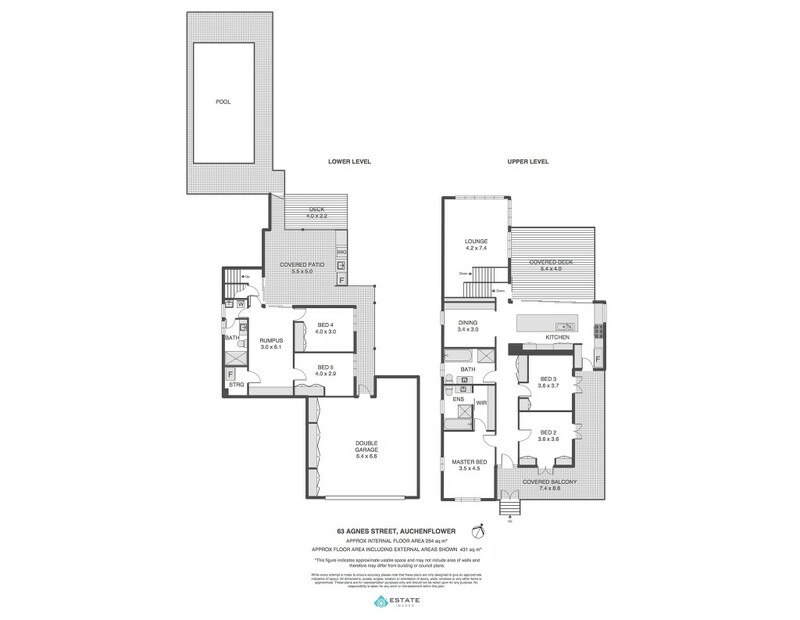 Completing this home is a remote, double lock-up garage, with fantastic storage. The home has ducted air-conditioning throughout. The location is outstanding. Close to everything - transport, shops, cafes, wonderful parks and schools, all in a family-friendly neighbourhood. This spacious home has it all and has been cleverly designed to perfectly capture the wonderfully relaxed Queenslander feel, while providing the setting for a stylish and comfortable lifestyle.